If you are reading this now it’s a sure bet that you have access to the internet. As the widely available use of the internet spread so did our dependence on it. When was the last time you brought a CD instead of downloading music? Or called someone instead of using an online messenger service. So it makes sense to use this readily available tool for education. That’s where eLearning in education comes in. Because of the benefits of eLearning it’s become a popular way to gain new skills. What are the Disadvantages and Advantages of eLearning in Education? ELearning, or as you may also know it as, is web-based learning or online learning. As the name suggests it is an educational experience essentially based on learning through resources on the internet. This could mean anything from forums, actual classes, or even just using an app. Whereas in the past you needed to be physically present somewhere to learn a new skill, now reliable internet is the limit! You can practice new skills with masters from across the world. Take online master classes with famous actors. Learn an art skill by watching tutorials. But eLearning may not be for everyone, just like anything there are advantages and disadvantages. Just remember that like any other tool it needs to be used correctly to see any benefits. There are so many advantages of eLearning, but since we don’t have all day I’ve stuck to 6! We all lead busy lives, so squeezing in some extra activities for our kids can create scheduling chaos. Travelling to and from activities just burns up more time. With eLearning this isn’t a problem. You don’t need to commute to and from a school for classes. The time you save doesn’t just help with scheduling your activities. It also saves money and can also help your child in their studies. The hours you would waste getting your child to classes could be used for reviewing or preparing for classes. This means extra study time, which often means your child will pick up this skill much faster. This also leaves the window open for you to schedule more classes, once again helping your child to gather those skills much faster. Like it’s mentioned above, by not having to take your child to a school or activity center for classes, you save money on transportation. This means extra funds for more classes! Most eLearning classes are also significantly cheaper than onsite classes. This is because the cost to put on these classes also tends to be low. This is because the providers don’t need to waste funds to rent a building or for materials. With eLearning all they need to focus on is creating the materials, stable internet connection, and staff. This all benefits you, the user. Since more focus is on the materials for the class you will be getting the best resources available as classes are more structured. To me this is the most important reason when it comes to selecting activities for my child. I want to make sure he is given the very best, and this comes through personalized support. This is the top benefit of eLearning! As I hinted above, by learning through online resources as a student you aren’t reliant on others for your studies. This means you can follow your own pace. In a normal class a teacher would follow a stricter schedule to ensure all students are learning similar skills. Whereas in an eLearning based class the teacher will follow the student. Through personalized support children can achieve so much more as they can pace their learning. This is because you are able to take courses anytime and anywhere as long as you have an internet connection. Through their educational lives, children do not get many opportunities to be in charge of their studies. Until they are older they are expected to take core classes, even if they do not like them. One of the great things about eLearning in education is that it gives that power back to your child. Children can pick what classes they want to take, when to study, what to study and for how long. From experience you are probably aware that you learn or remember things when you have fun. Think back to your cherished memories of your school days, the ones you remember are the ones where you had positive interactions. A favorite teacher that made an otherwise boring subject fun perhaps? Well eLearning makes the whole learning process more entertaining and therefore approachable to students. That’s because it is often based with game-like features to help keep students engaged. Because it also differs from traditional lessons at school that students are used to, they are more likely to want to learn. That’s because it’s new and interesting. Perhaps not something that would have easily crossed your mind when you are thinking about the benefits of eLearning. But it’s important to keep in mind the impact we have on our planet, and eLearning is a green learning tool. That’s because most eLearning tools are paperless and don’t require you to travel there. Some basic research showed that eLearning generated 85% less CO2! This is a fantastic achievement. The last few years there has been a big push for use of eLearning in education because of the benefits it provides. But like anything there can be disadvantages, sometimes eLearning is not a good match. Humans are highly social beings. Although at times it may not seem like it, as a species we have the ability to learn extremely fast. In childhood, as in adulthood, we can learn things by watching others, or by trying it ourselves. Research shows that in early childhood children are aware of others interactions and use this as an aid to exponentially increase their learning. What that means is that children do not learn effectively from watching screens. However, this research focused on early childhood (1 to 3 years old), and on children learning by watching TV, no eLearning was tested. So the jury is still out on this one. The best reason to use eLearning tools is also it’s biggest downfall. It takes a lot of discipline, which many children don’t have. This tied with the fact that home usually corresponds with rest and fun, makes children less likely to take regular classes. That’s why it’s extremely important to have regular scheduled classes a few times a week. If it becomes part of the family routine the child is more likely to get ready themselves and take charge of their own learning. This type of learning environment can also lead to other less favorable outcomes in learning. Since the teacher is not actually present in the room it is much easier for a child to cheat or plagiarize to pass their learning objectives. The best way to avoid this is to help the child realize that getting praise for achieving something may not be the most important thing. That’s also why at Lingo Bus we suggest parents watch their children’s classes. Although eLearning classes are great in the aspect they follow your progress, they can get lonely. This also plays into the first point. In a classroom when other students make mistakes you will learn from them as an example. Since in an eLearning class it’s just you and the teacher it can take longer as it’s just you making the mistakes. It also means you don’t have anyone else to talk to about your studies. However, more and more eLearning platforms are providing online group classes. At Lingo Bus to get the best of both worlds, group Chinese classes are available. They include the same resources as our individual classes that students can practice on their own, but classes are taken as a group. Whether eLearning is right or not for your family depends on personal circumstances. But at least now you will be able to think clearly about the benefits and disadvantages. In this topic I tend to be rather biased as I have created many personalized eLearning based classes that have helped students. Because of this I think the benefits of eLearning outweigh the disadvantages. The thing to take in mind is that its downfalls can be mitigated with good support. Learn more about the benefits of raising bilingual children! If your child is aged between 5 to 12 years old, I suggest classes with Lingo Bus. Classes are done around your schedule, and can be done anywhere, anytime. 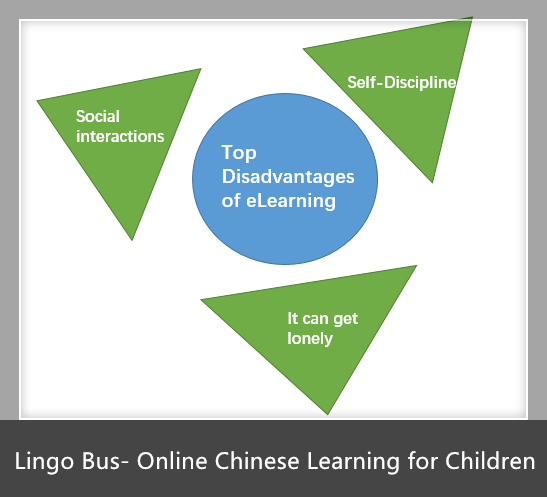 To encourage your child to keep learning Lingo Bus provides numerous learning tools and resources for your child, such as a huge online library and flashcards. If you are interested in your child taking a demo class press here. Lingo Bus also provides fun activities through our Facebook page, you can keep up with us here.